Quick Summary: Two things stand out for me with the TechFit Abs Trainer. These are that abs equipment does not often come with an onboard computer… Secondly, you’ll lie on top of this one, rather than on the floor facing up. Comments from buyers show that this is an effective machine (too effective for some!). It trains your abs, thighs and bum – and gets as intense as you can manage. Add the fact that it folds away, and you’ll see why the TechFit Abdominal Trainer makes the best-sellers list over at Amazon.co.uk. Check out the gallery and user comments for yourself now on the dedicated product page. ✅ GET IN SHAPE-Easy to use, our AB Trainer will shape your body faster than other machine using your own weight. Train your back, arm, hips, tummy, bum and leg combined in one exercise. 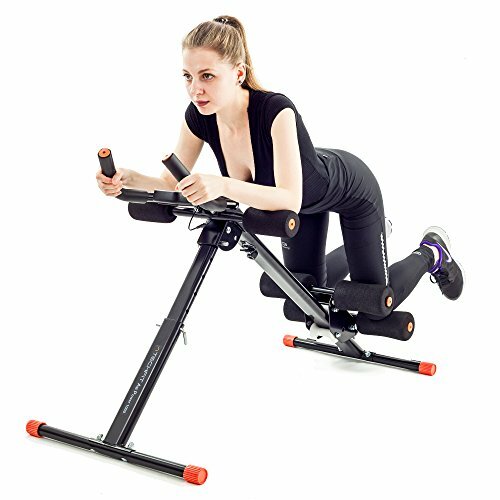 ✅ STURDY FRAME-Made of metal steel, the frame will allow exercises at high intensity without any risk of breaking. It is ideal for your daily aerobic workouts. You’ll receive a sturdy steel frame, which unfolds into a V shape. One end looks like the handlebars of a spinning bike, along with foam pads to rest your arms. At the bottom end are two sets of foam pads, which your knees go between. The bottoms are wide, and have plastic attachments for stability. This abs machine weighs in at just over 10kgs, and can be folded away. That should keep it portable where needed. It comes with a 24-month warranty from the manufacturer (always a good sign!). To get results, you use your own weight to pull the knee-pad part upwards. With your arms comfortably out of use, the abs and core areas take the strain. That strain results in trim muscles, and with the resistance higher, can give you a tough workout. The computer console sits between the handlebars. Most abs training equipment relies on the user to keep count. Having the key information displayed has a dual role. This will keep you informed of the reps completed, calories burned, and time taken. It will also allow you to track your progress over time. As with all abs equipment, don’t do too much at the start – if you have not exercised your core for a while, you’ll find this can be sore. You will need 2xAA batteries for the console, these are not supplied. I also recommend a floor mat. This will protect either carpet or your wooden floor. You can use this as sound proofing for all of your fitness equipment. What Did Previous Buyers Say About the TechFit Abs Trainer? Positive feedback for this one… instead of glowing superlatives, the word which jumps out a lot if ‘effective’ (and close variations). One buyer seems to have given only 4 instead of 5 stars because it works the gut hard. I’m pretty sure that is the idea, whether or not you have worked your own abs in a long time! It was also noted that this is easy to put together. Wrapping Up: Ready for Tight Abs? There is little doubt that this is an effective machine. Not only will it tighten those abs, your core, back and bum will get a workout too. If you have a layer of belly fat, you’ll need to burn that off before any 6-pack underneath becomes visible (same concept for abs toning belts). Adding to the benefits is the easy storage (it folds flat). Not many pieces of abs and core fitness equipment comes with a computer console. Check out the full gallery and those comments from previous buyers for yourself now on the dedicated amazon.co.uk product page.